Our two boys are very different people. Baby 2 is a leader. He knows who he is and what he likes and, for better or worse, he is loud about it. He drives us nuts sometimes but we know he will never want for friends and that his voice will never be lost in the crowd. He's a born cool kid. Stinky is our introvert. He's a quiet autodidact but he's also not totally comfortable in his own skin. We worry that he will be a follower, always swept up in the tides of what other people are doing and saying and liking. Fortunately, Stinky has not caught on to the stigma of joining the chess club and that's exactly what he did this week. Aaron taught him a few weeks ago and he decided it was the coolest game ever. When the flyer for chess club came home he hovered 2 feet away from me until I had filled out the registration and put it in the mailbox. And so that is one more thing I have added to our weekly schedule. Chess club, swimming lessons, and jiu jitsu on top of homework, chores and hopefully a little bit of family time. I have a kindergartner and a 2nd grader and I'm a total taxi mom. I was totally opposed to this life! How did this happen?!? Anyway, the point is that dinner is freaking hard when you're living in your car most afternoons after school. Sometimes I'm super on top of things and get all prepped early but, more often than not, I'm scrambling at 6pm trying to get dinner on the table before my kids need to get ready for bed. 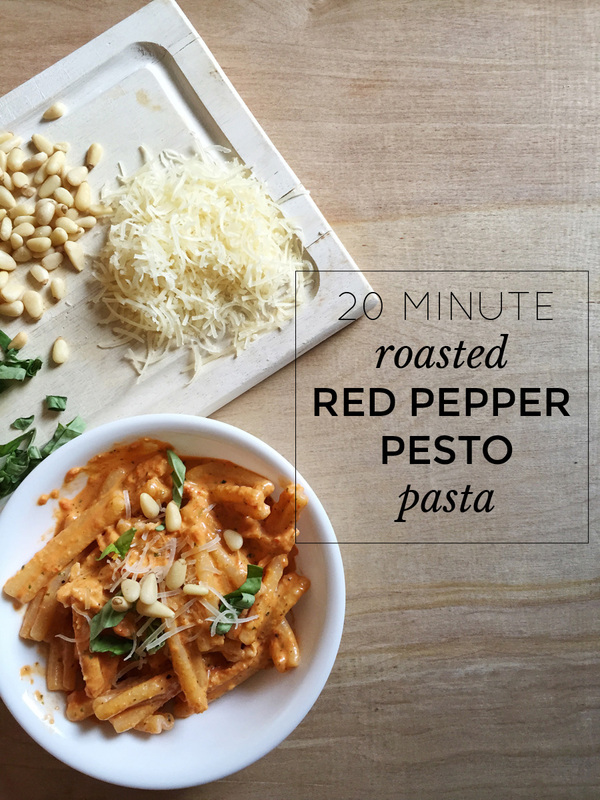 This roasted red pepper pesto comes together in the time it takes to cook the pasta and everyone in my family loves it (including the baby, who dyed her high chair orange last night with her pasta mess). I usually buy a rotisserie chicken at some point during the week, shred it up and keep it in the fridge in a container to make dinners a little easier. I'll use about 1/3 of the container when I make this recipe. If I don't have any rotisserie chicken on hand I'll just cook and shred one chicken breast. You could easily do more chicken if you'd like or leave it out entirely for a meatless meal. Bring a pot of salted water to boil and cook pasta to desired doneness. While the pasta cooks, throw the olive oil, garlic and pine nuts into the food processor and give it a whirl. Add the parmesan cheese chunks and process until the mixture forms a paste. Add the drained roasted peppers and basil leaves and let process until thoroughly combined. Drain the pasta and return to the pot. Stir in the sauce and the chicken and leave on the burner for just a couple minutes until it's all heated through. Serve with pine nuts, parmesan and basil for garnish.